A visit to Ofsted, the UK’s high profile school inspection agency, was followed by visits to agencies running academy schools and school sports, and a special course on science teaching in primary schools. 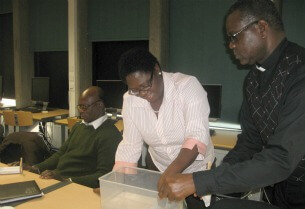 Jackie Glasgow-Browne, from St Vincent in the Caribbean, Joe Takeli from Solomon Islands, Rev David Agbo from Nigeria and Dauda Seidu from Ghana are half way through their nine week fellowship programme run by the Anglican Alliance and funded by the Department for International Development. The need for regular inspections as part of improving and maintaining standards in school. The importance of sharing best practice to enable schools to raise standards. That collaboration not confrontation is the way to improve educational standards, with self-evaluation by schools playing an important role. The need for clear guidelines in terms of curriculum and delivery to improve and maintain standards in teaching and learning . “This will help us improve our system of assessment in Solomon Islands, and especially to get schools to carry out self-evaluation,” said Joe Takeli. The fellows visited the Church School Learning Trust, a faith-based agency which runs a number of academy schools. Rt Rev Peter Hullah, the trust’s group executive director, explained that the academy movement was aimed at improving school achievements and his trust’s goal was to achieve this within a faith context. The movement was a response to the educational under-achievement of some children in disadvantaged communities. “The academy system is necessary in a changing world like ours if we are to meet the challenges of the time,” said Dauda Seidu. Sports provided a different way of enhancing learning, Jo Collins, head of physical education strategy at the Schools Sports Trust told the fellows. It could be used to help children learn in academic areas such as language and sciences. It gave them opportunities to achieve, provided them with leadership and team-building skills and helped to integrate people from different backgrounds and ethnic origins. “The lesson from the School sports Trust was that sports provides another platform that can bring understanding and tolerance between diverse faiths and ethnicities of students. For example in football, we have one ground rule and involve people of diverse beliefs and races in team work. A good sports curriculum will be another angle of solving faith challenges,” said Rev David Agbo. At the Institute of Education, the fellows took part in a customised training day on science curricula for primary schools. They saw a range of activities that enabled children to explore science, but using simple materials. 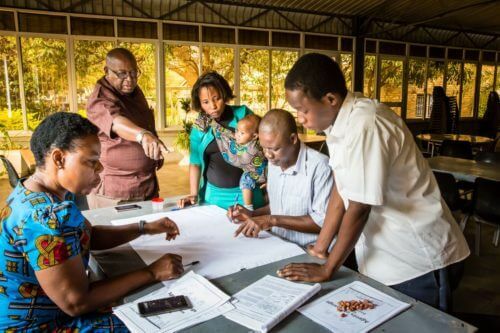 This would enable them to plan science curricula with practical applications at home.